Notes: These emplacements were in essence a basic Panther turret fitted on top a small underground bunker. 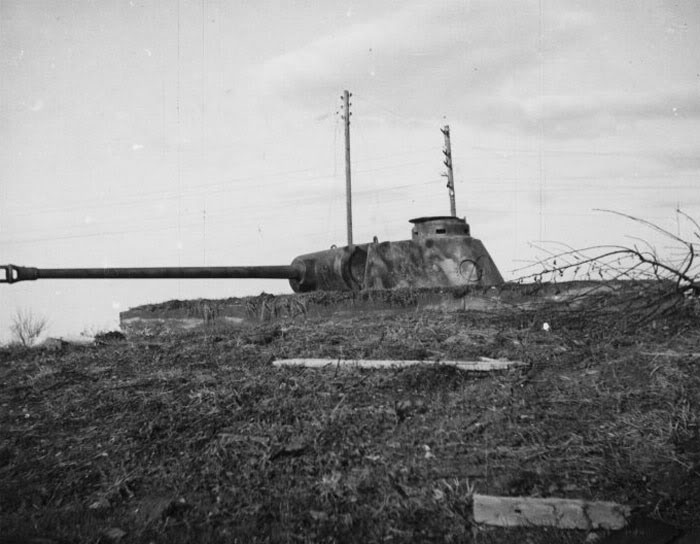 These emplacements were relatively easy to install and with the firepower and armor of a Panther's turret, it made for a formidable strong point to overcome. These emplacements were common on both the Western and Eastern Fronts and used extensive in Italy during WWII. Be sure to get the Battleground WWII core rules set for all your weird and straight WWII gaming. Vehicle Chart: Use whatever Panther vehicle chart that has the same turret fitted to the bunker. Use a D4 when rolling for a hit location with the 1 being the commander's cupola, 2 the left side of the turret, 3 the middle of the turret or gun and 4 the right side of the turret. Crew: The emplacement has a crew of 3 (commander, gunner & loader) and can house an additional 2 fully equipped troops for perimeter defense. Treat as Vehicle Crew Except…: Crews will act as vehicle crews in all instances except for Morale, Tank Platoon Integrity Checks, Tank Leaders, Movement, Ramming, Anti-Tank Mines and the Crushing Things rules. This rules applies to any troops manning the bunker as well. Sighting: The bunker is considered a small target when it comes to targeting and sighting. Camouflage: Most bunkers were camouflaged prior to combat so to see at what level of camouflage was achieved before combat, roll a D4 and consult the chart below. Constructed. The bunker’s crew has had ample time to conceal their position from all angles. This camo will cause a +1 to all Awareness Checks and a +2 to all Sighting Checks against it. Improved. The crew has had some time to conceal the bunker to most threats with local vegetation or camo netting. This camo will cause a +1 to all Awareness and Sighting Checks against it. Hasty. The crew has been able to lessen the instillation scarring around their bunker and paint it but that’s about it. This will allow the bunker to still be considered Concealed when Sighting Checks are taken against it but it will not modify the roll in any way. It will also cause a +1 to any Awareness Checks against it. None. The bunker has just been installed, leaving the crew no time to camouflage it in any way. There will be no sighting modifiers against the bunker and it will be considered in the open. Prepared Fire Zones: Because these bunkers are specifically placed to offer the best fire possible, it is assumed that the location is prime or the crew have cleared their fire zones of terrain that could hamper their vision. This type of terrain is limited to what could be cut down or dragged away but features like hills, gulleys and other similar features are obviously unmovable. More permanent structures like buildings can be removed but there must have been ample time to do so. To see if the Germans had time to clear the field to their liking before the battle, roll a D20 and on a 10 or less the German Commander may remove up to D10 terrain features and on a roll of a 1 the German Commander can alter the field in any manner they wish with the exception of permanent features as described above. Zeroed In Fire Zones: These emplacements have zeroed in all possible enemy avenues of approach. To represent this, all fire taken within the Effective Range of the emplacement will get the Zeroed In bonus when firing. Ammunition: The emplacement has a much larger ammo capacity for both main gun rounds and MG ammo then any vehicle could manage so it is assumed to have unlimited MG, AP, Smoke and HE ammunition. Panther Turret: The turret will ignore any Un-Powered rules, because the turret has a generator within the crew quarters underground that helps to power the turret. Depending on the turret type there may be Pistol Ports present so just play it as WYSIWYG. IR Upgradable: This emplacement is capable of being fitted with the Sperber "Falcon" IR System as described in the IR Rules. Availability is an 8 on the Eastern Front and a 5 on the Western Front. Nahverteidigungswaffe: The emplacement is fitted with a launcher in its turret that is capable of firing small shells from within the safety of the turret. The launcher has a 360-degree field of fire and is capable of firing fragmentation, smoke or flare shells. It will cost the loader one action to load and another to fire the Nahverteidigungswaffe. The launcher may be rotated 180-degrees and be fired in the same action it moved. Both the fragmentation and smoke shells produce a Medium-sized template when fired. The shell's template can be placed anywhere along a 360-degree arc, 2" away from the center of the turret. The commander must be Buttoned-Up when the Nahverteidigungswaffe fires a fragmentation shell. Note that if the commander is exposed, the weapon will not be used until they duck down into the turret or they Button Up. This is due to the possibility of the round striking them while exposed. Penetration: When rolling on the Penetration Effects chart, follow all results replacing the word “Vehicle” and “Tank” with “Emplacement”. On the “Fatal Internal” result ignore the fuel system effects and on the “Internal Damage” result replace “Radio” with “Field Phone”. Treat all non-penetration results described on the Panther vehicle chart as normal. Emplacement Entrance: The emplacement can be accessed via the turret hatch or through the rear entrance to the underground armored compartment via a slit trench dug behind the emplacement. This slit trench also allows the crew to evacuate undetected if need be. Although this is the most common configuration there have also been examples of the emplacement with only access via the turret. It is up to the owning Commander's discretion as to what type they wish to field. Note that any entry door will have a Pistol Port that allows the occupants to fire any pistol, SMG, rifle or LMG from it with a 45-degree fire arc at a 1/2 to hit. Communications: The emplacement is fitted with a field phone that allows it to communicate with other units along the defensive line. Crew Issued Items: The emplacement’s crew will be personally armed and equipped as if a normal tank crew and any accompanying troops will be equipped as normal infantry. Field Works: These emplacements are often protected with barbwire fences, mines and other field works that prevented enemy infantry from easily assaulting it. The owning Commander can have any type of field works around the emplacement just as long as it is depicted on the tabletop, written down before the battle begins or agreed to by the BM. Wargaming Piece: There are several 1/48 kits of this emplacement or alternatively you can just use a Panther turret from another kit and just place it on the ground whenever you want it deployed.